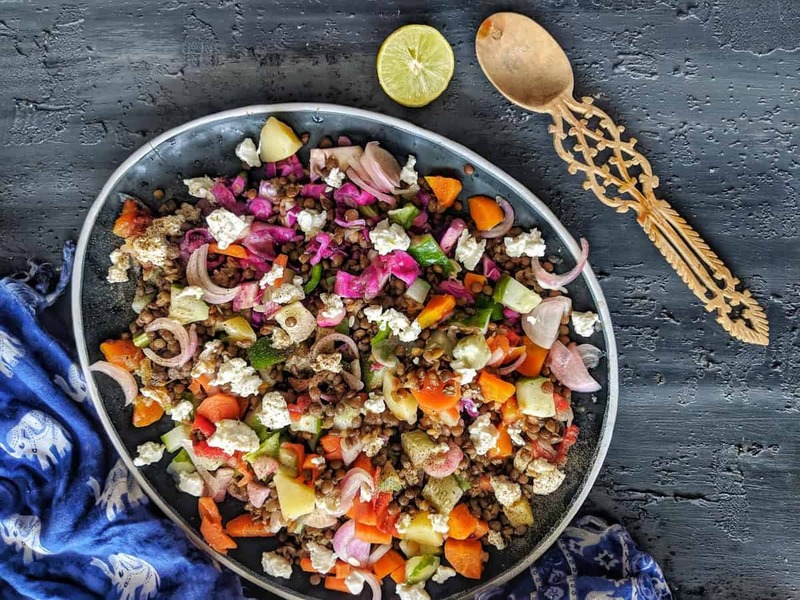 Wholesome goodness of lentils, veggies and feta cheese, sprinkled with olive oil, pepper and lime juice. No need to cringe the next time someone utters the word ‘salad’. For salads can be mind-boggling-ly tasty, easy to assemble and chock-a-block full of nutrition too. Try it to believe it! The good ‘ole whole red lentil aka chilke wali masoor ki dal is fast becoming one of my go-to staples in my pantry. And for good reason too – they are high in nutrition, quick to cook (unlike legumes or some pulses which need to be soaked overnight, lentils are good just 20 minutes of soak-time), and their earthy, nutty flavour can elevate the simplest of dishes to something else altogether. Great news for vegetarians and vegans – Lentils are considered an economical source of protein and fiber, with half a cup or 100 grams of cooked lentils containing as much as 9 grams of protein and nearly 8 grams of fiber, aside from 45% of Iron, 36% of Folate, 70% Magnesium, 14% Potassium, 58% Thiamin and a whopping 127% of B6 from your daily RDAs. American Heart Association (AHA) recommends lentils as heart-friendly food, owing to its high fiber and mineral content. 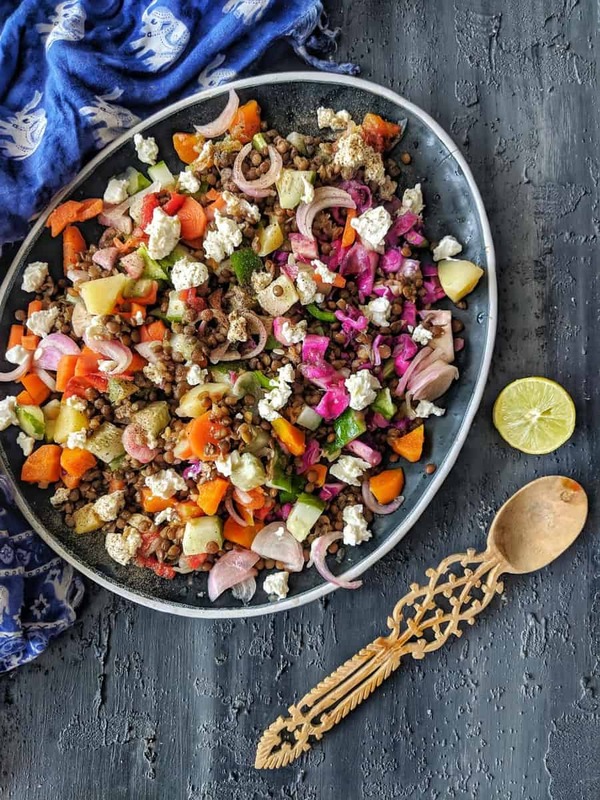 Of course, lentils are flavorful and pair beautifully with comfort foods too, which is why when I’m not making lentil stews, dal or making patties for burgers with them, I’m devouring them in salad form! This recipe is packed with colourful veggies as well..I’ve put in carrots, cucumbers, tomatoes, sweet potatoes, radish, onions and red cabbage. If it sounds like too much, well, that’s the good thing about this salad – change the veggies and customize it to suit your palate and your refrigerator contents. However, I suggest you load it up with veggies, to benefit from their rich micronutrient profile. I love how my salad looks like a rainbow here – there are ample benefits of making your food colourful. I believe it’s the goat milk feta cheese that ties the ingredients together and makes the salad yummilicious. However, if you do not have that handy, fret not – cottage cheese/ any other form of cheese or even avocadoes would do beautifully too! Bring 2 cups of water to boil in a pan and add lentils with a pinch of salt. Once the lentils are al-dente, turn off the heat, remove any foam formed on top. Set aside to cool. Once cool, mix all ingredients listed above. Garnish with freshly ground pepper, pink salt, olive oil & lime juice.